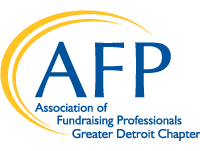 2019 AFP Greater Detroit Philanthropy Award Nominations Now Open! The 28th Annual National Philanthropy Day is the Association of Fundraising Professionals (AFP) Greater Detroit Chapter's premier event, to celebrate and honor the passion, commitment and leadership of Southeastern Michigan's philanthropists, distinguished volunteers and those in the fundraising profession. We will be hosting National Philanthropy Day on Wednesday, November 6, 2019 at The Henry in Dearborn. Nominate a Deserving Individual or Organization! Nominations are now being accepted for the 2019 Philanthropy Awards in eight award categories. Links to award criteria and past awardees are included below for reference. Categories and criteria are outlined here. For a list of past awardees, click here. Submit your nomination forms by Monday, May 6 at 5:00 PM. Questions? Please contact Steve Ragan, chair of the 2019 National Philanthropy Day Awards Committee at steve.ragan@developmentcounsel.net. Awardees typically support more than one nonprofit. Be sure to include clear examples of how your nominee impacts your organization and others in Greater Detroit. Most successful nominations have references and letters of support from multiple nonprofits. Ask your colleagues at other nonprofits that have benefited from your nominee's work to provide letters of support and be available as a reference. Answer all the questions on the nomination form and provide clear examples. Most nominations fail not because the nominee isn't an outstanding philanthropist or volunteer, but because the application is weak. Feel free to contact the National Philanthropy Day Awards Committee Chair, Steve Ragan (steve.ragan@developmentcounsel.net or 248-872-6900) or other committee members, if you have questions about how to prepare a strong application. Remember, if you have an outstanding donor or volunteer that might not be competitive for one of the National Philanthropy Day Awards, you can always recognize them as a Distinguished Volunteer for your nonprofit - it's a very special honor that your donor or volunteer will cherish.